To achieve recognition of their quality, the 19 communes around Lake Grandlieu discussed the possibility of creating a regional appellation. The region has a special microclimate due to the lake’s 9000 hectares. It is said to be the biggest lake on the European plain. 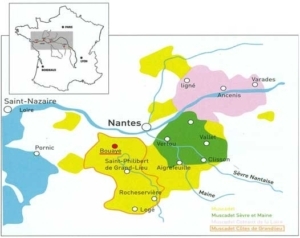 The national committee of experts appointed by INAO studied and analyzed the criteria defined by the growers and, in December 1994, approved the recognition of the new Côtes de Grandlieu appellation. Côtes de Grandlieu is differentiated by parcel delimitation and by adult vines more than 7 years old, which inevitably adds to quality. Created in December 1994, the Muscadet Côtes de Grandlieu appellation’s first wines appeared with the 1995 vintage. 25 years later, the appellation enjoys a very positive image, as its Muscadet wines are often considered to be rich, fruity and elegant. . Situated to the north of Lake Grandlieu, the commune of Bouaye enjoys privileged exposure. Its south-facing slopes, covered with gravel, favour early maturity.